The New Zealand Education system is rated one of the best in the world (Legatum Prosperity Index 2013), and is based on encouraging the enjoyment and discovery of learning, and not forcing memorisation of facts. Every public school is a “local” school, where education is provided for every child living in that school zone. Most parents are very happy with the education provided by their local school, with only 5% of school children attending private schools, and very few attending schools out of their zone. Unlike in other countries, children are not divided at an early age into separate Vocational schools and Academic schools, but each school provides the same broad education up to Year 10. Up to then, students get a small amount of optional choice, but after Year 10, their subject choices become more specialised, and Level 1 of the National Certificate of Educational Achievement (NCEA) begins. Year 11: (Level 1 NCEA) - some students specialise in completely academic courses while others take mixture of academic and vocational subjects. Year 12: (Level 2, but some may do other subjects at Level 1) - as above, students may take a mixture of academic and vocational subjects, but many finish school at the end of the year to go into other training for vocational qualifications. These are often at an ITP (Institutes of Technology and Polytechnics) offering qualifications from Level 2 to Level 9 (Master’s degree). Year 13: (Leve 3, but some may do other subjects at Level 2, or even Level 1) This year was traditionally focused on students studying academic subjects to gain the University Entrance qualification (UE) and going on to a degree at a University or an ITP. Nowadays it is quite common for students to stay on after Year 12, and study a mixture of subjects. However, these students are not eligible for UE (More about this below). For International Students, another factor is very important:, how well are students helped and supported? How can parents judge the quality (and climate) of a school? These are taken from the 5 yearly Census, and estimate the income level of all of the people living in that school zone. For example, in a Decile 10 school zone, the average income of all adults is in the top 10% of all New Zealand income earners. However, that is only an average. Every school zone will have a mixture of wealthy families, and less-wealthy families. For parents, it is assumed that more wealthy parents will be more interested in their child’s education, and their children will be better motivated to succeed. However, this is not always true at all, and as above, many schools, even at Decile 5, will have many high income families. As above, students begin NCEA at Level 1 in Year 11 and can study all academic subjects, or all vocational subjects, or a mixture, and will finish school with a range of credits at different levels, and in various subjects. The overall results of NCEA for each school are published annually, and can be easily misinterpreted. Some schools have a large proportion of their students studying easier vocational subjects, so naturally will show much higher pass rates in NCEA than schools where most of the students study academic subjects. Some schools encourage all students to attempt UE, but other schools do not allow students to enter UE unless they are sure they will pass, so their pass rates in UE will be much higher than other schools. The higher pass rate does not mean that they are doing a better job for their students than other schools are. These published results are accurate, but easily misunderstood. Schools who want their statistics to “look better” can restrict entry to UE courses, while schools who cater to a wider range of student needs will have statistics that do not look so good. Parents should treat these figures with caution when choosing a school. The ERO visits every public school regularly to make an in-depth analysis and report, which is published on its website. The majority of schools fall into a 3 year cycle of visits, but some do not. Three years: - good performance, with elements of high performance. Four-to-five years: - high quality performance is evident. 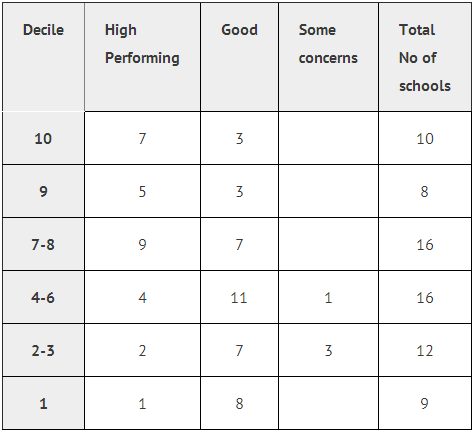 There is a separate section of each report about how well the school looks after International Students, and how well the school complies with the NZQA “Code of Practice.” All schools are good, but some are excellent! Members of the Choose New Zealand Education Alliance will have a summary of the main points of their ERO report listed on our website soon. The ERO report gives a much better idea to parents of how well a school performs academically, and how well it looks after its students. However, the ERO report is a lengthy document, and our summary will be the easiest way for parents to evaluate various schools. New Zealand schools offer a very wide range of sports, cultural, and community activities. Larger schools usually offer a wider range of “co-curricular” activities, and may specialise in Rugby, Athletics, or Swimming, or in Music, Theatre, Dance, or Art. Smaller schools may provide an environment where students can make friends, and get to know their teachers, more easily. Parents can see information about these on a school’s website. It is well understood in New Zealand that students should be well-rounded. For example, the University of Auckland Medical School no longer accepts applicants solely on academic success. Doctors must be able to relate to all types of people, so the Med School is looking for well-rounded students who have been involved in sports, cultural, or community activities. These criteria are being increasingly applied by many international bodies. 5. What other factors should parents consider? Boys school, girls school, or co-ed (mixed)? Busy city or quiet country? New Zealand offers a wide range of different types of schools, many emphasisiing different aspects of education, but all must meet quality standards set by the New Zealand Government. The results speak for themselves. Not only is our education system ranked best in the world (Legatum Prosperity Index 2013), but comparative tests of student performance show high world rankings. The Programme for International Student Assessment (PISA) is a worldwide study by the Organisation for Economic Co-operation and Development (OECD). Scores by New Zealand students for literacy, maths and science are amongst the highest in the world, and the measure of top all-round students, puts New Zealand at double the OECD average.